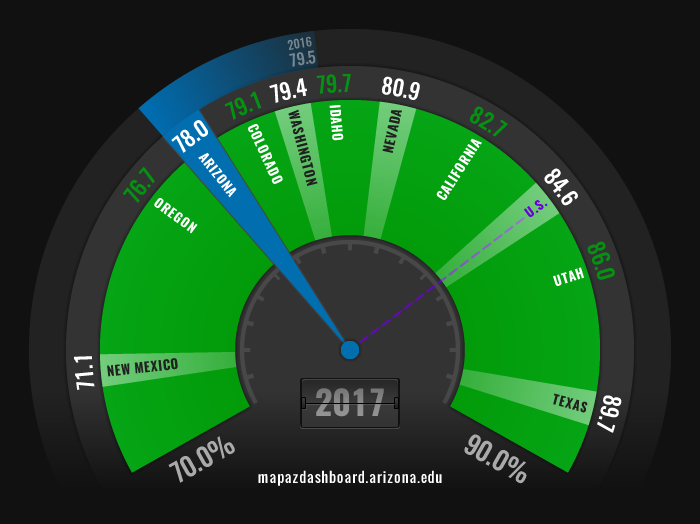 In 2017, Arizona had 78.0% of public high school students graduating on time, ranking eighth out of the 10 western states. Texas ranked highest with 89.7% of public high school students graduating, while New Mexico fell at the bottom with only 71.1% of students graduating. Within Arizona, Santa Cruz County had the highest graduation rate, with 90.5% of students graduating with their peers. Apache County placed last among Arizona counties with 73.6% graduating on time. Those who do not finish high school are much more likely to be unemployed, and when employed, their earnings fall far below those with a high school degree or higher. This gap can add up to a substantial deficit in earnings over a lifetime. Economic consequences follow through to the community at large with lower wages, less spending power, and the likelihood of higher costs for public assistance. A high school diploma, or its equivalent, is the basic prerequisite to college or trade school. Arizona followed the same general pattern as the U.S. in 2017, with respect to graduation rates by race and ethnic origin. However, Arizona rates fell short of national graduation rates across the board. In both Arizona and nationwide, more Asian/Pacific Islander students graduated on time than any other race or ethnicity. Arizona had 74.5% of Hispanic students and 73.8% of black or African American students graduating on time, while nationwide, 80.0% and 77.8%, respectively, graduated on time. Between the U.S. and Arizona, the largest gap in graduation rates existed for white students with a national rate of 88.6% and a state rate of 82.8%, while the smallest gap existed for Asian/Pacific Islander students with only a 2.2 percentage point difference. At 90.5%, Santa Cruz County had the highest percentage of public high school students graduating with their peers in 2017. Apache had only 73.6%, placing it last among Arizona counties. Pima ranked 14th out of the 15 counties in Arizona with 73.8% of students graduating on time in 2017. The high school graduation rate for the U.S. rose from 79.0% in 2011 to 84.6% in 2017, an increase of 5.6 percentage points over six years. During the same six-year period, the percent of high school students graduating on time in Arizona peaked in 2016 at 79.5%, but ultimately returned to the same rate posted in 2011, which was 78.0%. Pima County, which is also the Tucson Metropolitan Statistical Area (MSA), displayed a similar trend, peaking in 2016 at 77.6% and then dropping in 2017. However, Pima County’s high school graduation rates had a much steeper drop from 2016 to 2017 than the state and were lower than both Arizona and the U.S. across the board. The graduation rate of public high schools is based on the four-year adjusted cohort graduation rate (ACGR). The “cohort” measure of four-year graduation is the share of students who comprise a ninth-grade class and graduate by the fourth year, including transfers into the class, minus those who transfer out and deceased students. For example, those entering ninth grade in the 2008-2009 school year comprise the cohort measured by the 2012 data. State-level graduation rate data comes from the National Center for Education Statistics (NCES). County-level data comes from the Arizona Department of Education. NCES imputed the data from Virginia to come up with the Native American total.